A good ripe apricot is one of the joys of summer, but a woolly one is one of its cruellest disappointments. Living in central London means I am at the mercy of the fruit-sellers, and at best I only have a 50/50 chance of getting a good one. So, whenever I find myself in a place where an apricot tree is just one of those standard things you can expect to find in any field or garden, I get a bit over-excited. Which happened when I stayed at a friend’s house with a wonderful old garden in the hills behind Nice in the south of France. It was the end of the season so there were just a few remnants of the apricot harvest left. They were small, a bit lumpy, and covered in marks: they would never have made it through the beauty competition that would admit them to the market stall or supermarket shelf back home. But the flavour! Sweet yet sharp, with a hint of bitterness, they were terrific raw. But they were quite crisp, and weren’t going to improve with age, so I decided to make some jam. Overwhelmed with the scents and romance of the place, I added some lavender. Apricot jam has never tasted so good. This recipe makes a small quantity. This is deliberate, as I like to reduce both the amount of sugar used and the cooking time, making a fresher, sharper jam. However, this also means that it does not keep nearly as well as something more cooked and/or with higher sugar content. I recommend keeping the jar in the fridge and using within a few weeks. Tear the apricots in half, remove the stones and set 2 or three of them aside, and tear the apricots into smaller pieces according to preference (my apricots were small so I tore them into quarters), Put them in a bowl with the sugar, the juice of at least half a lemon and the lavender flowers, cover, and leave at room temperature for up to a day and at least overnight. The apricots will start to ooze their juice and dissolve the sugar, making a delicious and sweet smelling gloop. Meanwhile, take your apricot stones outside and hit them with something heavy, protecting your eyes and fingers as you do so. The stone will split, revealing the little nut-like kernel inside. Remove the kernel and set aside. If you smash the kernel along with the stone try another one – you want to keep them whole and their thin almond-like skin unbroken. When you are ready to finish the jam, prepare a suitable storage jar either by heating in the oven or scalding with boiling water to sterilise. 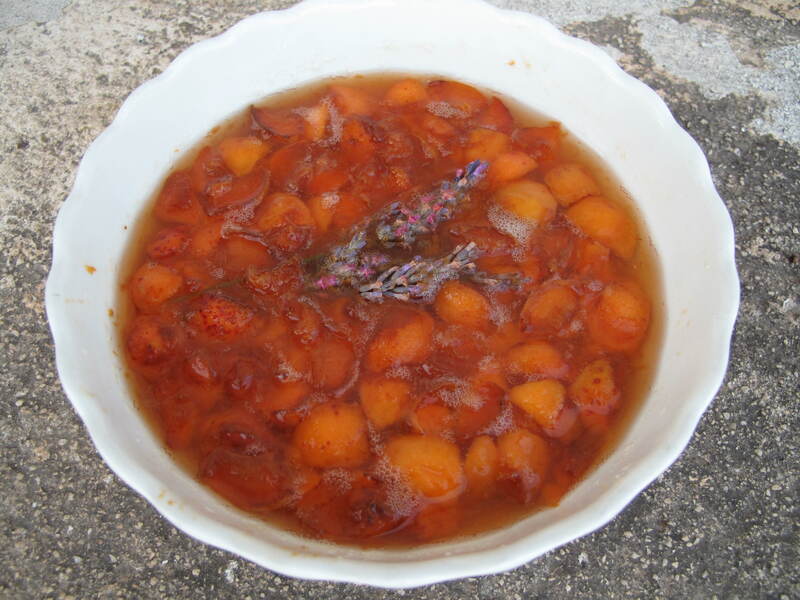 Transfer the apricot mixture to a large saucepan and heat gently, stirring to make sure all the sugar is dissolved, then boil for 7-10 minutes so that the jam thickens and is just beginning to set. You might need to skim a little white scum from the edges of the pan as it cooks. Pour the jam into the prepared jar, drop in a kernel or two, and seal. Once cool, store in the fridge.